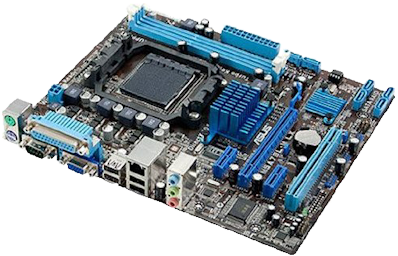 Low cost motherboard for the ATX form factor. It has an AM3+ socket for CPUs up to 125 watts, e.g. FX-8150 Bulldozer/Zambezi with eight cores. It has in itegrated ATI HD 3000 GPU video. Up to 8 Gig of DDR-3 1866MHz RAM (not counting overclocking). 6 SATA-2 ports, 2 USB-3, 10 USB-2, 1 x PCIe 2.0 x16, 2 x PCIe 2.0 x1, 3 x PCI. No onboard video. The main weaknesses are the lack of SATA-3 and max RAM limit of 8 Gig. Specifications.